Asia – The largest and most populous continent on earth. It shares landmass from Europe and Africa. Asia covers about 30% of the earth's total land area. It has about 60% of the total world’s population. Asia contains huge, deserts, some of the longest rivers and world's highest mountains. Asia is surrounded by the Black Sea, the Arctic Ocean, the Mediterranean Sea, the Pacific Ocean, and the Indian Ocean. 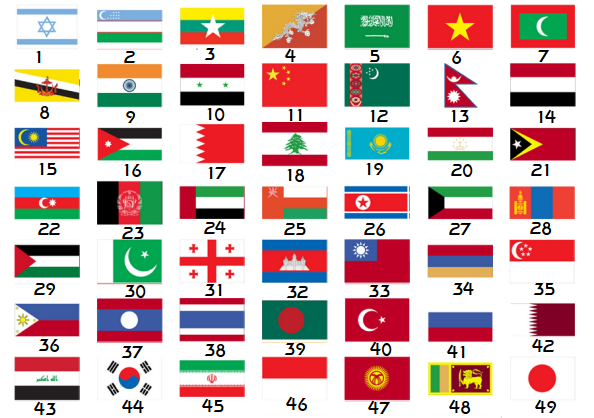 Asia consists of 48 countries, including; China, India, Pakistan, Myanmar, Cambodia, Japan, North Korea, Kazakhstan, Vietnam, Taiwan, Malaysia, Singapore, Bangladesh, Indonesia, Nepal, Bhutan, Afghanistan, Sri Lanka, Mongolia, South Korea, Thailand, Philippines, Turkmenistan, Kyrgyzstan, Tajikistan, Uzbekistan, and the Middle Eastern Nations of; Oman, Yemen, Saudi Arabia, Israel, Jordon, Lebanon, and Iran. Turkey and Russia span across both Europe and Asia. The languages spoken in Asia are Chinese, Hindi, Japanese, Bengali, Urdu, Punjabi, Javanese, and Korean. Religions in Asia are; Islam, Christianity, Hinduism, Buddhism, Shintoism, Taoism, and Zoroastrianism. Asia has landmass of 44,000,000 square kilometers. This makes Asia the largest continent of the world. The northeast of the Philippines and south of Japan is the most active place on Earth for tropical cyclone activity. The Gobi Desert in Mongolia and the Arabian Desert stretches across much of the Middle East. Himalayas is the most popular mountain situated in Asia. The range runs for more than 2,400 kilometers, and separates the Tibetan Plateau from the Indian subcontinent. Asia has the highest mountain peaks in the world: Mount Everest and K2. The mountain range contains more than 15,000 glaciers and also has plenty of freshwater sources. Other mountain ranges are: Hindu Kush, Pamir Mountains, Caucasus Mountains and more. The longest river in Asia is the Yangtze in China. 6,418 kilometers, Yangtze – third longest among world rivers. Another popular river is the Yellow River, it is also known as the "Cradle of Chinese Civilization". The Indus, Brahmaputra, and the Ganges are other important rivers. Asia has the second largest nominal GDP of all continents, and the largest in purchasing power parity. As of 2011, the largest economies in Asia are China, Japan, India, South Korea and Indonesia. Asia dominated the office locations with 4 of the top 5 being in Asia: Hong Kong, Singapore, Tokyo, Seoul and Shanghai according to Global Office Locations 2011. Approx 68% of international firms have office in Hong Kong. Asia is rich in natural resources, such as petroleum, fish, water, forests, rice, copper and silver. In Asia manufacturing has been strongest in East and Southeast Asia, particularly in Japan, India, China, Taiwan, South Korea, the Philippines, and Singapore. Japan and South Korea dominates in the area of multinational corporations, but increasingly the PRC. Many companies from North America, Europe, Japan and South Korea have operations in Asia's developing countries to take advantage of its abundant supply of cheap labour and relatively developed infrastructure. The Arabian Desert dominates as the Arabian Peninsula. It spreads over 2,330,000 square kilometers and is massive and arid. The chief natural resources present in this desert are oil, sulfur, phosphates, and natural gas. Other lakes in Asia are: Poyang Lake, Dal Lake, Lake Toba, and others.